You know those Taiwanese are always stealing their ideas from internet comics. Case in point: The Glow in the dark Duck was invented by Tim Jones from the comic Scary Go Round. Here is the introduction of said duck. Said duck was also made using an all natural process. 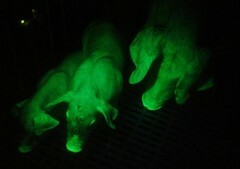 Wow, what an accomplisment of science, fluorescent pigs. Women would be more happy if scientists could make men -who behave as pigs– fluorescent. Imagine that? You go into a pub and you see all these green fluorescent humans. And men would be more happy if scientists could make fluorescent women who behave as ... ? And this is not from The Onion. Scientists in Taiwan say they have bred three pigs that "glow in the dark". They claim that while other researchers have bred partly fluorescent pigs, theirs are the only pigs in the world which are green through and through. Taiwan is not claiming a world first. Others have bred partially fluorescent pigs before; but the researchers insist the three pigs they have produced are better. They are the only ones that are green from the inside out. Even their heart and internal organs are green, the researchers say. The scientists, from National Taiwan University's Department of Animal Science and Technology, say that although the pigs glow, they are otherwise no different from any others. On May 24, 1844, Samuel F. B. Morse dispatched the first telegraphic message 'See what God has done!' over an experimental line from Washington, D.C. to Baltimore. The message was taken from the Bible, Numbers 23:23. The only true news nowadays: from "The Onion"
HARTFORD, CT—As the nation moves on from last month's family gatherings, churchgoing, and goodwill toward men, the annual post-Christmas readjustment process is proceeding on schedule, with millions of Americans forgoing their temporary generosity of spirit and resuming their petty, miserable treatment of one another. Though the joy and glad tidings of the holiday season are mere weeks behind us, sources report that more than 85 percent of 2005's Christmastime lessons have already been forgotten, with that number expected to reach 98 percent by as early as next week. "Christmas is a magical time of year when people of all ages and backgrounds put aside their differences and are reminded of the things that truly count: the joy of giving, the gleam in a young child's eye, and the sound of voices raised together in song," said James Samuelson of the Hartford-based Institute For American Cultural Mores & Values, which tracks the rise and fall of human love and kindness throughout the year. "Mid-January to early February, by contrast, is a magical time of year when people forget all about that stuff. This leads to mid- to late February, a magical time of year when people everywhere feel overpowering, soul-crushing emotional pain, causing them to hate their coworkers, their loved ones, and themselves." Evidence of this phenomenon can be seen across the country, with Christmas miracles of universal benevolence and spiritual uplift degenerating into mid-January miracles of everyday banality and neglect. Corporations that donated generously to the homeless and various charities mere weeks ago have resumed their usual cutthroat, profit-driven practices. Children who learned the important lesson that it is better to give than receive are refusing to share their expensive new toys with less fortunate playmates, gloating over their possessions and berating the other children for being poor. And the many career-focused dads who made a major breakthrough during the holiday season, vowing to spend quality time with their wives and children, are systematically unlearning these realizations of what truly matters and returning to their dysfunctional workaholic patterns. Oh, man! I remember when Nicolaus Steno published those papers. I was a young boy of 12 years old and I was blown away by his ideas! Now that I'm 349 years old, it seems so obvious. In 1669, Danish geologist Nicolaus Steno published a startling proposal: that the fossils and rock layers of the earth, if studied scientifically, gave a chronicle of the earth's history. One of the puzzles Steno addressed was that of fossilized seashells found high in mountains. Land and sea had shifted, he said. But there was already a "scientific" explanation: spontaneous growth within the rocks. So there was no need, as one contemporary put it, to "turn the world upside down for the sake of a shell." Ironically, the idea seemed to be more palatable among some theological conservatives than among rationalists: God could do whatever he wanted. I heard the version of 'One' by Bono and Mary J Blige, and I don't like it. However, I like MJB's new cd, especially the song 'MJB da MVP'. but you already know me. Oh MJB, my soul hip-hop queen. I like the Johnny Cash version better. When I moved Jadedturtle to its new server back in the summer of 2005 I never put my pictures back up on the site. Well they are back up now. Maiko and Casey's Wedding and some others.